When friends from San Diego arrived earlier this week for vacation, we made the drive from Anchorage to Kenai, making a few stops along the way for a ride on the Alyeska tramway, a jaunt up Portage Valley and scoops of ice cream in Cooper Landing. During the road trip I asked them what they might like to eat while visiting, and they requested I make them some wild, local salmon. One of these lovely ladies admitted to never having enjoyed salmon and was hoping this trip to Alaska could turn the tide. She went on to say that the only way she had enjoyed cooked fish in the past was a traditional Baja-style fish taco — a San Diego staple. Challenge accepted. I was immediately inspired to take sockeye fillets and incorporate classic fish taco ingredients like crisp shredded cabbage and lime crema to create a salmon taco salad for our guests, putting San Diego and Alaska together on the plate. I ran to the store to grab some ingredients, then returned and went straight to work on our lunch. We chatted while I chopped, seasoned, cooked and layered the salad, and then they waited patiently as I snapped a few pictures just prior to serving. They immediately commented on the vibrant red color of the salmon and how it looked so much different than the salmon they had tried in the Lower 48. We sat down to eat, crumbling corn chips in our hands to sprinkle atop our salads and applying finishing dashes of Tapatio hot sauce. A couple of bites in, my friend declared the recipe a success, and we took out our iPhones to snap pictures to capture the moment when a salmon hater became a salmon lover. It's in these moments around the table with friends, discovering new flavors and trying new things amidst the plentiful laughter and occasional tears that inevitably come when you gather together, that I am reminded why I do what I do. For the mango avocado salsa: Add the mango, avocado, red onion, jalapeño and cilantro to a medium-sized bowl. Squeeze lime juice over top, season with salt, and stir to combine. Cover and refrigerate until ready to serve. For the salmon: Heat a heavy-bottomed skillet to medium-high heat. Add the avocado oil to the pan. Pat each fillet dry and season each with salt and pepper. In a small bowl, stir together the chili powder, cumin and sugar. Sprinkle the seasoning mixture over each fillet to coat, patting the seasoning down so that it adheres to the fish. Sear the salmon fillets in the hot pan, about 2-3 minutes per side for medium (cooking times will vary depending on the thickness of your fillets), being careful not to overcook. For the salad: Lay out four salad plates or shallow bowls. Divide the greens evenly into each of the bowls. Top the greens with the shredded cabbage, followed by black beans. Top the beans with the salmon fillets, followed by the mango avocado salsa. Drizzle everything with lime crema and sprinkle with crumbled corn chips. 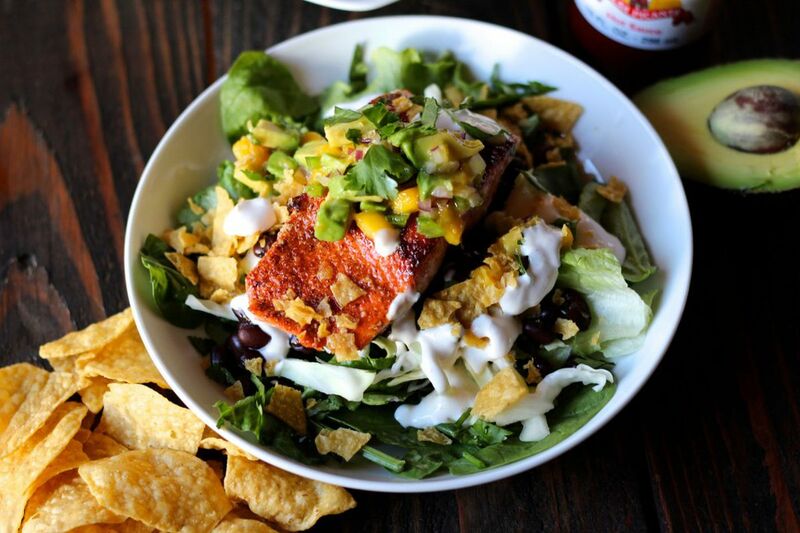 Serve the salad with more corn chips, lime wedges and Tapatio hot sauce on the side.